Dr. Barry Zirkin and Dr. Haolin Chen are both professors of biochemistry and molecular biology at John Hopkins Bloomberg School of Public Health. They’ve spent years studying the effects of aging on testosterone production and what causes the hormone’s decline. Their experimentation has apparently led them to promising breakthroughs in the areas of stem cells and cellular reproduction. Their research has also resulted in some clarification. For example, it’s often repeated that a major cause of primary hypogonadism (lower testes production) from aging is that the leydig cells “die.” This is not the case according to a quote by Dr. Zirkin in an article from an Oct 2012 online issue of The Baltimore Sun. “Leydig cells don’t die. But they age and become decrepit, and less useful”, Zirkin said. Another revelation from their work is that there’s no apparent ‘signal’ from the brain telling the testes to slow testosterone production with age. The pituitary gland appears to remain programmed to send a positive signal for T-production well into older age. That means something is thwarting youthful hormone production in the fully intact cells. Is it the effects of lipid peroxidation… accumulated damage done from all the production that’s come before? One doesn’t need to look far to find the two researcher’s names on a number of animal studies related to testosterone. One such study looked at glutathione and its effects on the testes and testosterone of both young and old brown Norway rats. The first part of the study was done in test tubes (in vitro). The leydig cells of a group of rats were incubated with buthionine sulfoximine to determine if depletion of glutathione results in a reduction of testosterone. Buthionine sulfoximine (BSO) is a chemical compound known to significantly reduce glutathione levels. Sure enough, BSO reduced glutathione in the cells by 70% and testosterone production by about 40%. Incidentally, when some of these BSO incubated cells were presented with the antioxidants vitamin E, N-tert-butyl-α-phenylnitrone, and Trolox, testosterone production was preserved while glutathione was not. Vitamin E is a well known oil-based antioxidant. 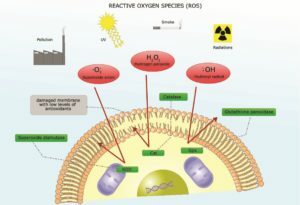 Trolox is a water soluble analog of vitamin E. N-tert-butyl-α-phenylnitrone is a “spin trap” antioxidant, which means it selectively intercepts reactive oxygen species rather than chemically reacting to them the way most antioxidants do. In vivo studies were also conducted. Both young and old rats were injected with BSO twice a day for seven days. When their leydig cells were then isolated and analyzed in vitro, glutathione was reduced by 70%. This was accompanied by a 50% reduction in the leydig cell’s ability to produce testosterone. The researchers observed reductions in intermediaries of testosterone production that are similar to that seen in aging. There was a drop in cAMP, STAR protein, cholesterol side-chain cleavage, 3β-hydroxysteroid dehydrogenase, and 17α-hydroxylase/17,20-lyase. The following is how they finished their summation. In other words, an age related drop in glutathione might be a reason for age related drops in testosterone. There are a couple of ways to test this out over time. One is by increasing antioxidant intake which generally leads to higher glutathione levels. The other is by simply taking a glutathione supplement, some of which have recently been improved for better absorption. Here’s a short list of supplements that can raise endogenous glutathione. Remember to always consult your physician before using supplements. N-acetyl cysteine (NAC) – This antioxidant is actually used to prevent acetaminophen overdose from causing liver damage. It can significantly raise glutathione levels. Incidentally, 600 mg. combined with 200 mcg of selenium daily was shown in one study to raise testoserone. Resveratrol – Dietary sources are red wine, blueberries, cranberries, peanuts, pistachios, dark chocolate. Be careful; it’s an anti-estrogen and in its role as such, I’ve seen anectdotal claims of too much intake causing libido to get knocked right into the dirt (obviously not desirable). Grape Seed Extract – Effective antioxidant shown to raise glutathione. Like reseveratrol, however, a certain amount (under 500 mg daily) seems to provide positive effect on sexual performance and too much can have a negative effect. Alpha Lipoic Acid – This both lipid and water-based antioxidant has been shown to increase glutathione and improve symptoms of peripheral neuropathy. 600 mg daily seems to be the dosage deemed to have the best safety/benefit ratio. Here’s a short list of top dietary practices for higher glutathione. Cruciferous Vegetables – Increase intake of broccoli, kale, collards, cabbage, cauliflower, watercress, garlic, brussel sprouts, onions. These are all high in sulfur, which is necessary for maintenance of glutathione. Glucose Control – Evidence shows that high glycemic intake actually lowers intra-cellular glutathione levels. So going with slow-burning carbohydrates helps optimize glutathione. Easy on the Alcohol – As with its effects on general bodily health, moderate drinking is probably not a threat to a healthy person’s glutathione levels. But too much alcohol lowers glutathione due to the body’s use of it while detoxifying. What about straight-up glutathione supplementation for testosterone? This is something worth considering but only if an absorbable form of the supplement is used. Most supplemental forms of glutathione get damaged by stomach acid before ever reaching the bloodstream. 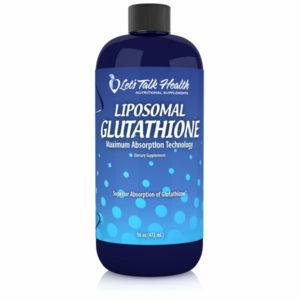 Marketers of Liposomal Glutathione claim to override this drawback by coating their glutathione with a lipid membrane. This is said to allow the glutathione to be absorbed intact within the protective shield of a dietary fat. Could liposomal glutathione help some men build and preserve testosterone levels over time? If I were to place a personal bet on being able to raise my own levels, I’ll probably go with ‘super-duper’ undenatured cold filtered whey protein from grass-fed cows… along with a reputable alpha-lipoic acid supplement.